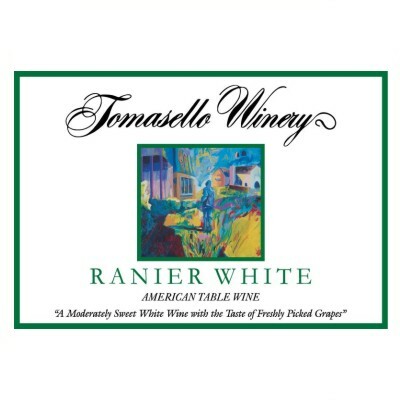 The Tomasello Ranier White is a sweet white wine with the taste of freshly picked grapes. It is intensely fruity through and is made primarily from the Native American Niagara grape. With a dessert sweetness level, it is perfect with cakes and semi-soft cheeses. Made for over 86 years at our family’s vineyard, it enjoys a very loyal following that continues to grow every day! For the sweeter palette, it is the softest intensity of the Ranier collection. The Tomasello Ranier White is a sweet white wine with the taste of freshly picked grapes. It is intensely fruity through its grape character and is made primarily from the Native American Niagara grape. With a dessert sweetness level, it is perfect with cakes and semi-soft cheeses. Made for over 78 years at our family’s vineyard, it enjoys a very loyal following that continues to grow everyday! For the sweeter palette, it is the softest intensity of the Ranier wines.